Customer Information Systems (CIS) or Passenger Information Display (PID) systems as they are also known have a distinct purpose; to deliver information in an unambiguous way about trains, metro/subway vehicles and buses. The information provided will include forecasts about arrival and departure times, details about the nature and causes of disruptions and additional facts such as train formation (e.g. how many coaches a train has, where first class is situated, and which coaches have disabled access). Today, CIS displays can provide more visual content; with combinations of technology types, the range of formats available and data feeds used allowing for provision of advertising and Really Simple Syndication (RSS or web page) feeds, alongside transport details. As well as keeping customers informed and helping to manage their movement, systems are equally invaluable to transport operation staff, keeping them up to date and allowing delivery of station or area-specific information. When selecting a CIS there are several key influencing factors to consider. What offers the most cost-effective solution once the points above have been considered, both in terms of the capital investment and the running costs. For railway infrastructure companies and train operating companies (TOCs) legislation, approved codes of practice and official standards all apply to the provision of customer information and to the equipment used to provide it. For those providing information to passengers in the UK, in 2012 the Office of Rail Regulation (ORR) placed new conditions into rail companies’ licences making their responsibilities regarding passenger information very clear. This covered much more than just CIS displays but did, of course, include them. In July 2016 the ORR updated its regulatory guidance , which explains more about the process, how it covers the entire customer journey and what licence holders need to do to be compliant. Revised in October 2016, this document specifies the steps that should be taken by TOCs and station management to ensure that their arrangements for providing customer information can be delivered in a structured and consistent way. This Approved Code of Practice is intended to reflect good practice and is advisory only. The extent to which any organisation chooses to comply with any or all of its contents is entirely at its own discretion. Considering the products themselves however, there are standards and legislation that must be adhered to. In the United Kingdom, products must be the subject of an NR catalogue number to allow use on Network Rail’s infrastructure. All Infotec’s products and systems are the subject of Electromagnetic Compatibility (EMC), Low Voltage Directive (LVD) and PRM TSI certification corresponding with current EU directives. In addition, Infotec is RISQS approved by audit, which qualifies our ability to work on Network Rail’s infrastructure. To meet the needs of the Equality Act 2010 (formerly the Disability Discrimination Act) LED displays must utilise a minimum of 9 dot fonts, with full descenders on each letter. A descender is the portion of a letter in a Latin alphabet that extends below the baseline of a font. For example, in the letter y, the descender would be the “tail,” or that portion of the diagonal line which lies below the v created by the two lines converging. As well as making this possible, Infotec’s F series displays offer wider viewing angles, improved contrast ratios and the ability to show enhanced graphical notices in full screen format. It could not be clearer! To comply with the Technical Specification for Interoperability (TSI) for Persons with Reduced Mobility (PRM) there are minimum font sizes for display viewing distances. Products are certified to meet the latest PRM-TSI guidelines and so ensuring they comply is very easy. 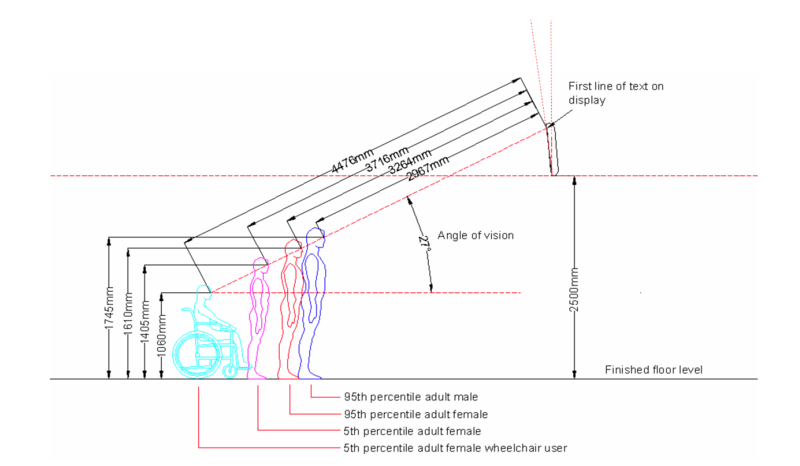 The diagram below helps demonstrate the relationship between viewing angle and distance for categories of user, which in turn will define character heights. Infotec will be pleased to assist further if required. Displays must be legible in all light conditions experienced at the location. The higher the levels of ambient or surrounding light, the brighter the display needs to be. In direct sunlight a screen may need be able to produce 1500 Nits (candela / m2)in order to be legible, in a shaded area on a sunny day approximately 1000 Nits and indoors or in a shaded area on a dull day around 500 Nits. For reference, a desktop computer screen produces around 200-300 Nits and a HDTV around 450 – 1500 Nits. The colour and size of the letters and numbers, the colour of the background and the gaps between lines and characters all affect the clarity of a display. In terms of text size, a guide is that half the character height in metres is the readable distance for averaged sighted people. So, for example, 30mm characters have a 15m view distance). The greater the contrast between the text colour and that of the background, the easier it is to read. The most commonly used combinations are white or yellow characters on a black or dark blue background. Recommended line gaps are between 1.25 and 1.5 of the line height. The range of places in which passenger information displays are being located is increasing. The obvious platforms, station concourses, transport hubs, waiting rooms and bus stops are of course still used and key, but added to them can be in-station retail and leisure outlets, bridges, above lifts and escalators and in neighbouring shopping centres. On-vehicle displays (OVD) have become increasingly popular, with these being used to provide information to passengers inside vehicles as well as ones mounted on the outside of vehicles to be viewed externally. The location of the displays will help determine the type of technology used, the configuration of the display and if any features are required, for example to ensure displays are not affected by temperature extremes, altitude and even seismic activity. The physical location and access to local connectivity determine the technology and design of a display, and the way in which data is delivered to it. Selection will be determined by what is available in the location concerned, and, of course, which will provide the most reliable result. Display products have Ingress Protection (IP) ratings. Developed by the European Committee for Electro Technical Standardization (CENELEC) these indicate the degrees of environmental protection provided by the display enclosures. The first number indicates the level of protection from solid objects or materials and runs from level 0 which means they offer no special protection to level 6, which indicates the enclosure provides total protection against dust. The second number indicates the level of protection from liquids and runs from level 0 which indicates they offer no protection to level 8, which means the casing protects against long periods of immersion under pressure. Customer information displays are required to be IP54 minimum, while IP65 is preferred and stipulated in UK. Infotec’s displays go even further, being IP66 rated, offering robust protection. For underground stations, operators have further specifications; for example, London Underground and Tube Lines require products to meet their standards, which include Low Smoke and Fume and Electro-Magnetic Compatibility. Following a major fire at King's Cross in 1987, The Fire Precautions (Sub-surface Railway Stations) Regulations were made under Section 12 of the Fire Precautions Act 1971 and were brought into effect in 1989. This places place strict legal requirements on the fire safety of materials used in the building and fitting-out of stations. By taking all the factors outlined here into consideration, an informed choice about the best passenger information display system can be made. As a result, passengers will be able to plan their journeys; they and those meeting them will be reassured they are in the right place at the right time; and the details will be available to all. Infotec has been assessed by Safety Schemes in Procurement to help reassure buyers of its high standards. Infotec's gallery has been updated to provide images and basic details about the latest customer information displays. Two members of the Infotec team have successfully completed a workplace first aid course. Last orders for one of the power supply units used in some LED displays has been extended to the end of January 2019. Stations including Portsmouth Harbour and Walton-on-Thames are to benefit from white LED displays which offer user, environmental and economic advantages over their yellow counterparts. The Maltings, Tamworth Road, Ashby-de-la-Zouch, Leicestershire LE65 2PS.